When we redid our patio a number of years ago I bought some new planters to accessorize. And I was determined to make them as low-maintenance as possible. As a landscape designer, spring through fall was non-stop busy for me, and the last thing I wanted to do at night or on the weekends was tend to a bunch of fussy plants. I also had no interest in re-planting those planters every year – so perennials were high on my list of “must-haves”. 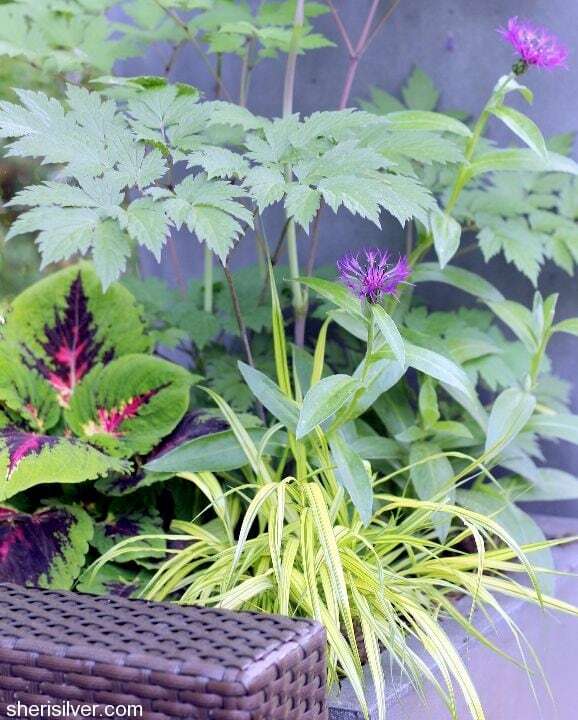 I love love love using perennials in containers – they broaden my range of plant choices (beyond the often same-old annuals), and minimize the number of new plants I need to purchase every year. 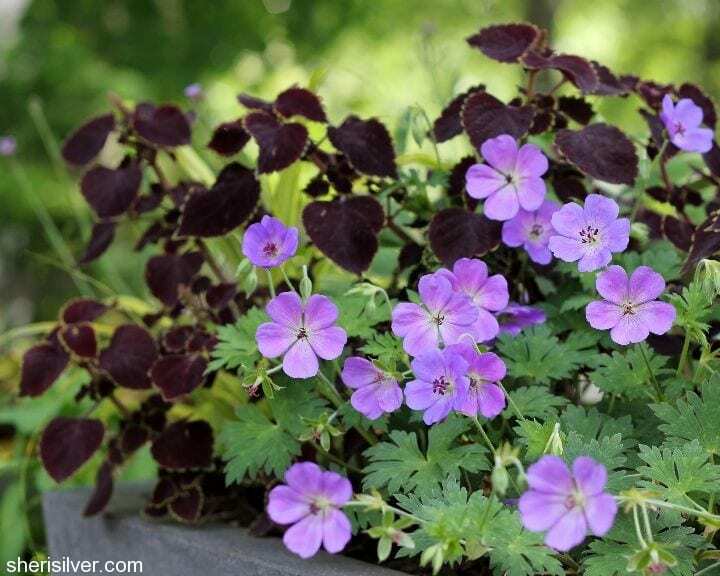 Bloom times – with annuals, you can pretty much count on what’s available at the nursery blooming at the time you plant them (i.e., pansies in the spring, mums in the fall). But perennials are available for much of the year, and can be in various stages, depending on the season. So be sure to do your homework and read those labels! If you use your deck in the summer, you may want to rethink that early bloomer. 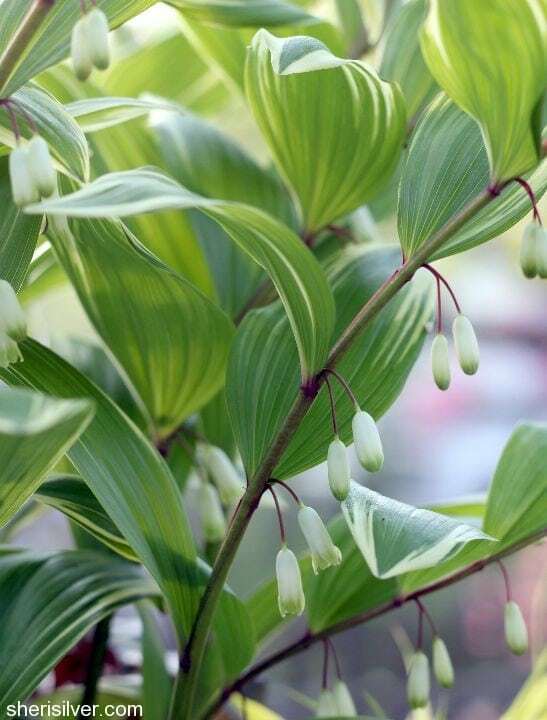 This charming plant blooms in early May – typically before I get out back to enjoy the flowers. But it also has lovely variegated leaves and burgundy stems, making it a valuable addition to my planters all summer long. I actually enjoy the leaves even more than the blooms. 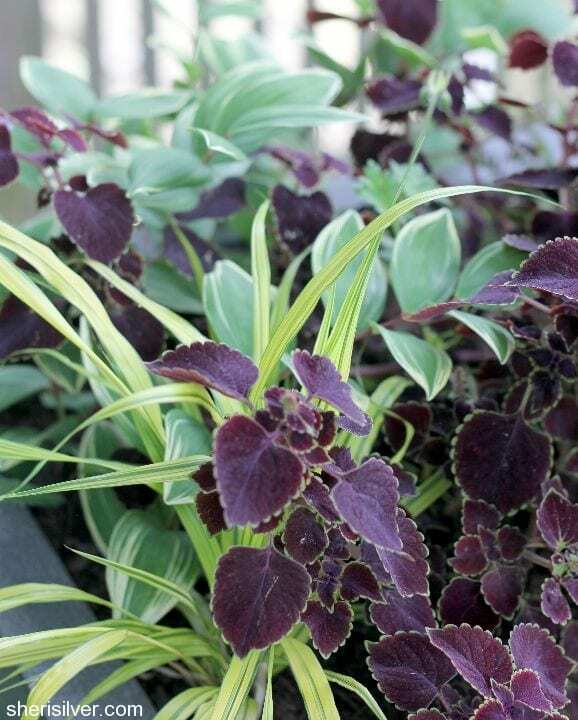 They hold their own amid the bold foliage of the plant’s container-mates, and I love how the stems complement the coleus leaves. Think beyond flowers – The trade-off to perennials’ coming back year after year is that they have a relatively brief bloom time – a few weeks at most. Yes, you can “trick” many plants into re-blooming (by deadheading) or blooming later/in stages (by cutting back), but we’re going for low maintenance, remember? So look for plants that are multi-taskers, possessing great features beyond their blooms. Features like distinctive foliage, unique form or interesting seed heads. Coral bells (pictured lower left) have gorgeous foliage that changes color as the plant grows, making for an almost ombre effect. It blooms too, but the flowers are so insignificant that I usually just prune them off. 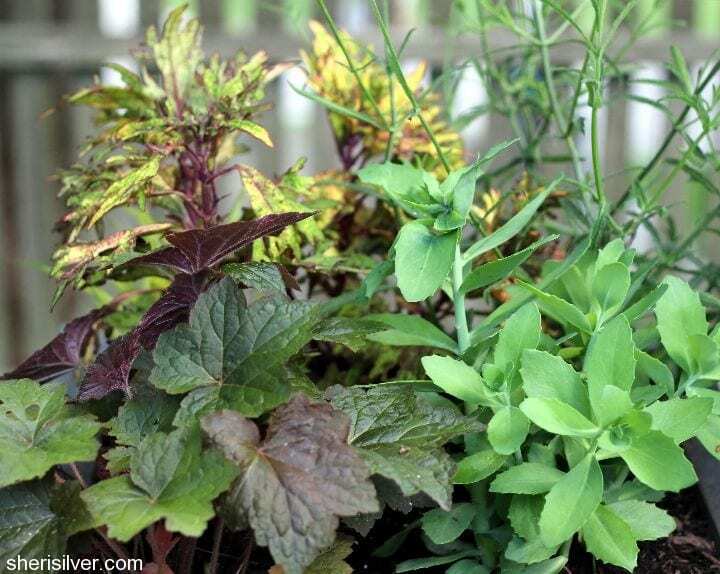 Sedum “Autumn Joy” (pictured lower right) is one of my favorite perennials to use in planters – the succulent-like foliage lends a tropical effect, and the flowers change colors through the seasons – from a light green to pale and then deeper pink, finishing up with burgundy by the fall. Snakeroot (pictured top) blooms very late – sometime in September – but I’m treated to its feathery foliage all summer long, along with some nice height. The foliage also darkens in color as the season progresses, which I love. Hakone grass (pictured lower right) is a great examples of a carefree foliage-only plant whose beautifully colored leaves stay vibrant all season long. Perennial geraniums are floriferous – as you can see – but also have gorgeous bronzy-red foliage come autumn. Keep in mind that (just like in the garden) a perennial may “outgrow” its home and need to be divided – but this is a good thing as you’ll have the benefit of new plants to place elsewhere (or give away)! Do you use perennials in containers? Have you experienced any challenges? Please share here, and as always – ask away!